For someone who signs her emails as "Annoying", Sheila is certainly not that. 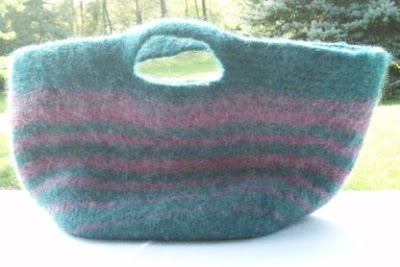 Keeping her hands busy during some trying times, she knit and felted this fabulous bag for me. I just love it. It is soft and subtly colorful and is especially wonderful for having been made by hand. Imagine my surprise when I received a padded envelope in the mail several days ago. (I love mail!) Inside was this panel--a sign of solidarity from one horsewoman to another. 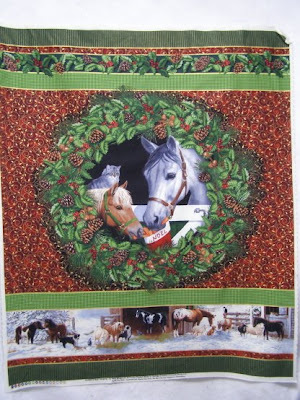 I can't wait to get it quilted and I have a special place I will hang it for the holidays. And, who you ask, was it from? None other than "Not-so-Annoying". So, Sheila, thank you...you are an amazing friend. My world is better for having you in it. 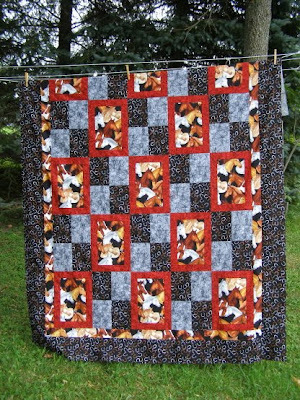 Happy quilting, happy fall, happy everything! A couple weeks ago my mom and I went to a "garage sale". Quotation marks are used because it was a giant accumulation of stuff at a sale held in one location. (Unlike wandering from site to site in search of that elusive best-thing-ever.) 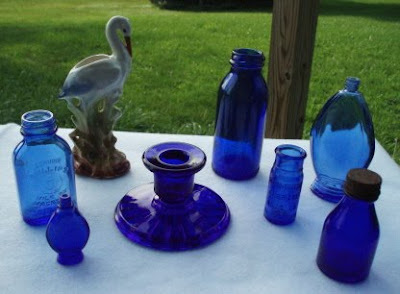 I love cobalt glass (and pink depression glass) and I hit the mother lode that day! The candle holder was a gift from my mom from the summer, but it fit in nicely with this display. 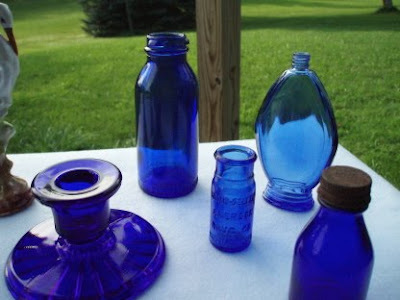 In an effort to more "stylize" my pictures, I took the items to the corner of my front porch and actually covered the bench with white material to better show the glassware. What I realize is that I will never be like the Blackbird Designs ladies, whose pictures are what I aspire to, but sadly fall far short of. I did try. 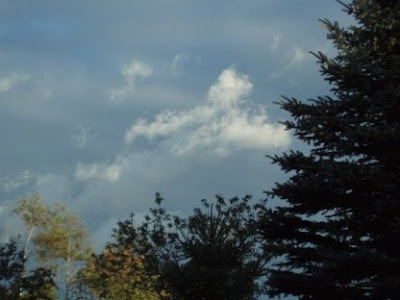 I think the bird may be a stork--or a heron. 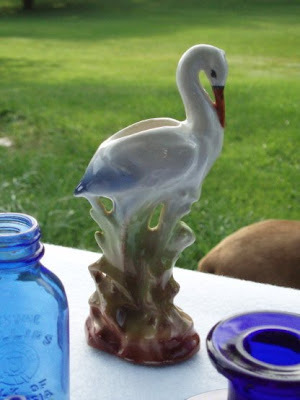 I'm not really sure, but I looked at it several times and just loved the graceful lines and the soft coloring. A bargain for $2. It's actually a vase! When I got it home and was looking more closely, I found the mark that it was made in Czechoslovakia. It is so pretty. You just never know what you'll find--part of the thrill, I think. 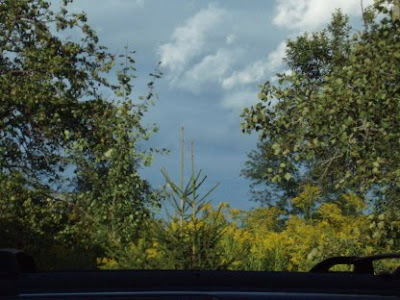 It's great to have lots of stuff in one location, because, truth be told, I am not a big fan of stopping, getting out, looking, getting back in the car and then driving and repeating the process untold times. I think that's why I prefer auctions! Sometimes the most obvious solution is staring you in the face and you just don't see it. 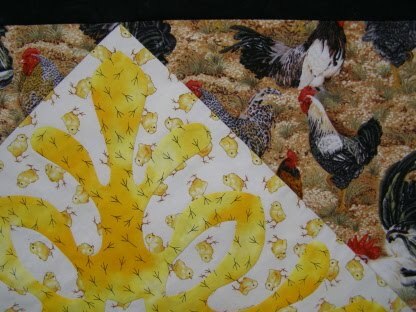 I had purchased the larger chicken print for a border for this piece. Unfortunately, the print was way too big for the size border I had anticipated using. 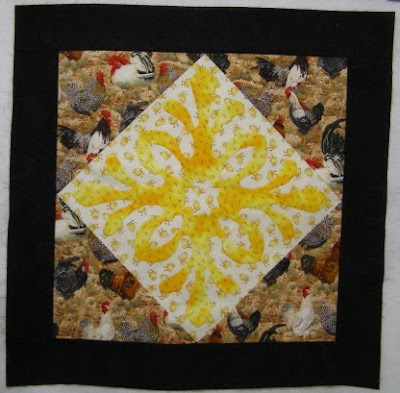 MONTHS later...I realized I could set the block on point and use the chicken print as the corners! Voila!!!!! The black print (newly-acquired) has a swirly, feathery design to frame the center. Here's a close-up. See the chicks on the background? And the chicken feet on the yellow? And see how the design sort of resembles chicken feet? (That was not intentional.) Too funny! Here's a look at the fabric for the back--also a newly-acquired piece (Timeless Treasures). So you see, most of the fabric I bought in August was to finish things! More surprises to come! 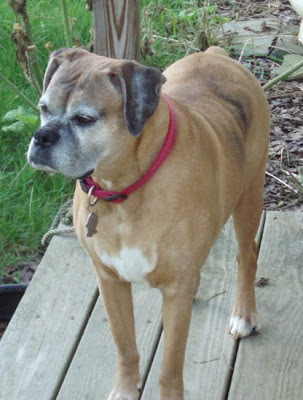 Lynnie said she hadn't been on the blog in quite some time. She posed very nicely a couple days ago, and I promised I'd make sure she was included. Other than that, it's been a paperwork day, although I did do a bit of hand stitching on a binding late last night. P.S. A new saying from Daisy Sour Cream: "A kind word can be as refreshing as a spring shower." P.P.S. I just updated my website: Just the Facts, Workshops/Lectures, and, most importantly, Schedule, in case any of you live close enough to get here for a class! I hope you can join me! From hot, humid summer to wet, cool fall. I love the cooler weather. It seems good not to hear air conditioners and fans running 24/7. Ahhh, peace and quiet. I took these pictures a couple days ago and thought I would share them. 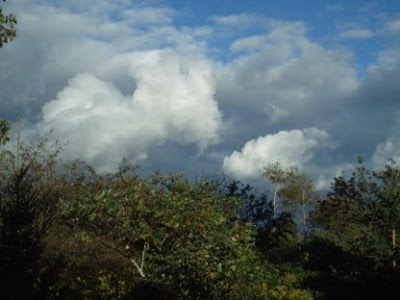 The cloud formations and the mix of pure white with gray was stunning that day. It's the time of the golden light--it makes everything seem just right. Enjoy! More stash busting pics to come, as well as my finds at a "garage sale". Over the weekend, I actually cut and machine pieced an entire quilt top! 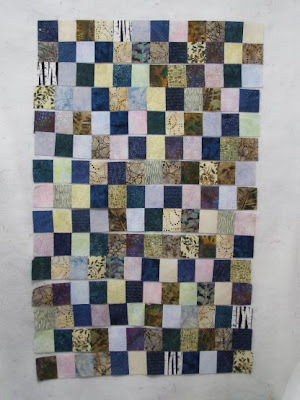 It is about 60 x 80 inches and I just love the fabrics. 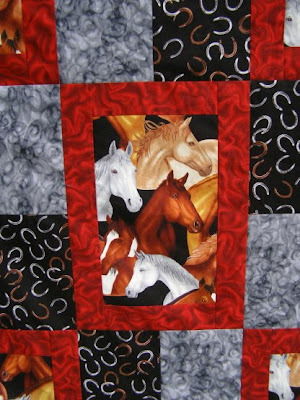 The horseshoe and silver/gray print went well together, and I think the red was the perfect accent, even though there is no red in any of the fabrics. I didn't have anywhere tall enough to take a full picture, so you will have to make do with an outside shot of most of it. 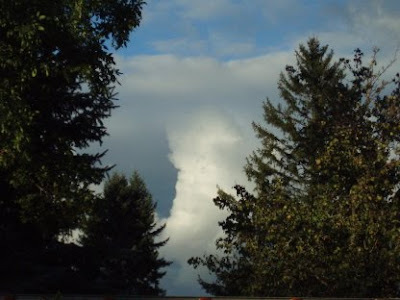 It is so striking! 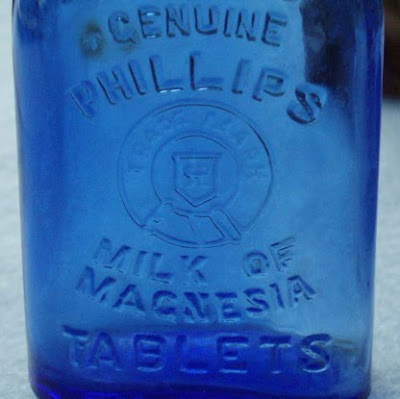 A close-up of one of the horse blocks. 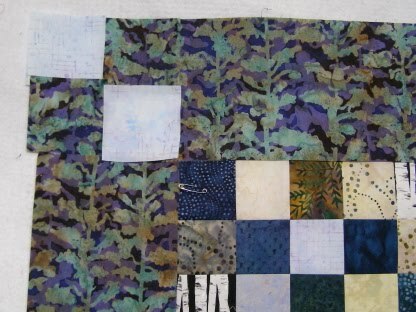 And a bit larger section of the quilt, showing the four-patches and the two borders. The pattern is in the June/July 2010 issue of Quilt magazine. 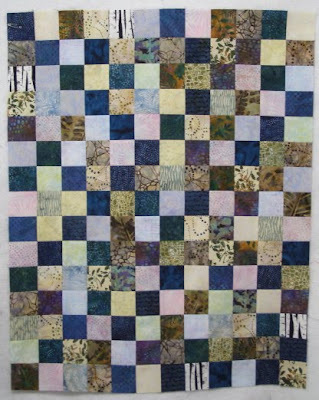 It is called Swing Patch by Karen DuMont. 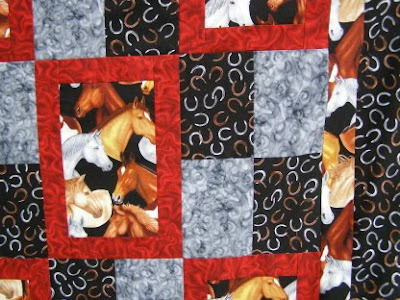 I rarely make anything from someone else's pattern, but this just spoke to me, especially for the large horse print. I almost didn't know how to act with yardage already figured for me! 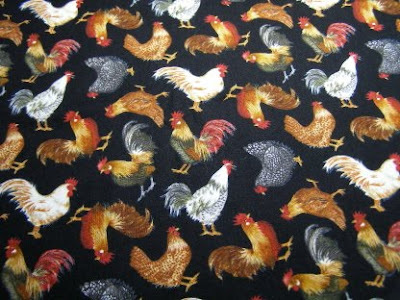 This is a pattern that would be so lovely in the large florals available now, or any of the other great novelties. Did you all enjoy the long weekend? Leaves are already turning color here in central New York. And the weather has turned brisk. Or at least it has been for the past few days. Rumor has it the temps will be back into the 80's by Wednesday. 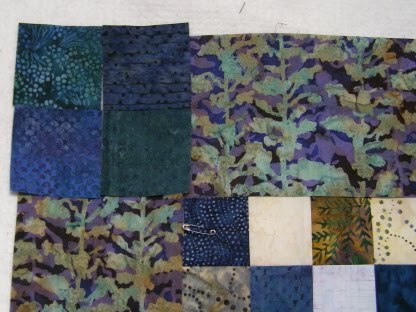 Since inquiring minds wanted to know.... Twenty plus fat quarters of batiks--purchased just a few weeks ago for the Lake George retreat. Colors and textures we would see at the lake. 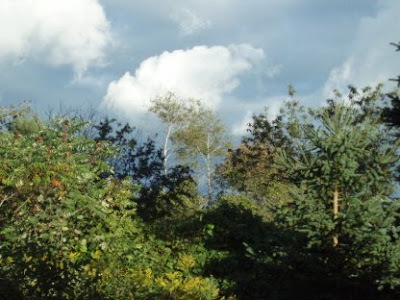 The birch trees were a gift from Myra at the retreat. A fun and unexpected surprise. Here is the top laid out and the top three rows sewn together. The border fabric was bought just a couple weeks ago--I thought it added a sense of depth and mystery to the center. But...a definite directional that did not look good when used on the top and bottom borders. So...what to do? In the first picture, you see two different corner options. 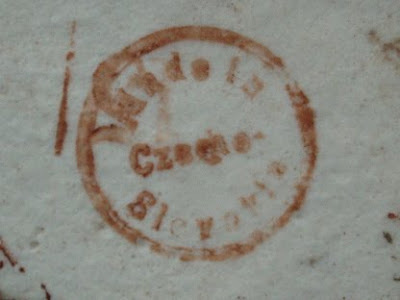 A plain square and a purple/tan four patch. Then the border fabric with a light blue in a four patch. 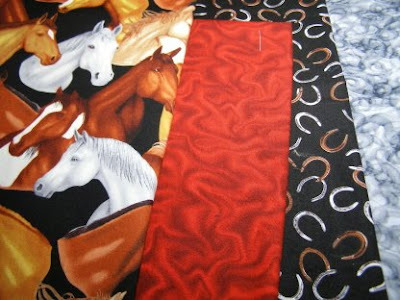 The same fabrics in reverse positions. 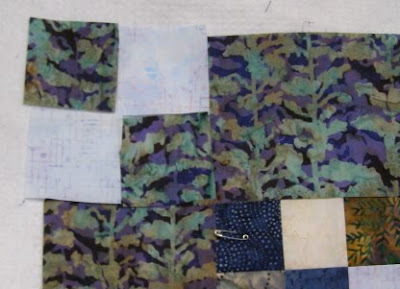 Four different fabrics in a four patch. 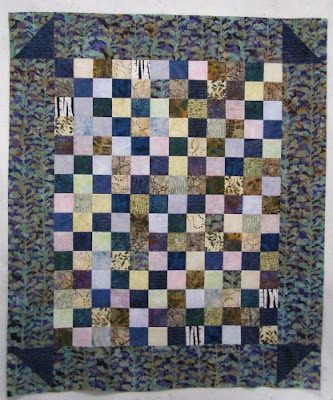 Half-square triangles to break up the borders on the corners. Both are directional fabrics and I used them to advantage. Looking at this quilt gives me a sense of serenity--much like the feeling I get while at Wiawaka for the retreat. I have my eye on a tree-printed batik for the backing--yes, coveting more fabric! P.S. I just finished listening to The Black Hills by Nora Roberts (most excellent!) and am now listening to Kindred in Death by J.D. Robb. I'm reading horse training/riding books at the moment, so I don't imagine most of you would be interested. If you are, let me know and I'll share! P.P.S. I recently heard of two quilters who had the new cotton/polyester thread by a well-known thread company actually MELT when ironed on a cotton setting! Literally melted and the seams pulled apart. Can you imagine? I'm sticking with good old 100% cotton thread. Just sayin'.